I was hungry for a stir fry the other night and since Matt was not feeling well (due to dehydration) I thought a veggie packed stir fry was in order. I used Gardein mandarin crispy chick'n (one of the few products in the line I am not allergic to) and a bag of frozen stir fry veggies. The Gardein was $3.99 at Target, which it is usually cheaper, but still beats out the grocery store by about $2. The stir fry veggies were less than $2 a bag. I like buying frozen, because I get a nice mix and the price is cheaper than buying a bunch of produce that the store may not even have. Since the sauce packet the chick'n comes with is not substantial enough I whipped up some more sauce with Braggs, rice vinegar, Sriracha and a fresh squeezed orange. I plated it on organic rice with some toasted sesame seeds (I kinda went crazy with them!) and a easy meal was born. About $7 for two beats take out prices any day! White People Tacos - what the heck!? So last night after the gym I decided to make tacos. I had chickpeas at home, taco shells, guacamole and salsa...I had to stop by the store to pick up some produce and ran into a bunch of pretty organic kale while buying some lemons (I need to ask my neighbor for more - but she has been so generous I feel bad/greedy). I picked up some lacinato kale and headed home. I sauteed kale, 1 can of drained and rinsed chickpeas with a bit of olive oil. I squeezed the juice of one super juicy lemon on top, added a big pinch of Mexican spice blend, a pinch of onion powder and a squirt of Sriracha. After tossing, I let it cook down for about 10 minutes. 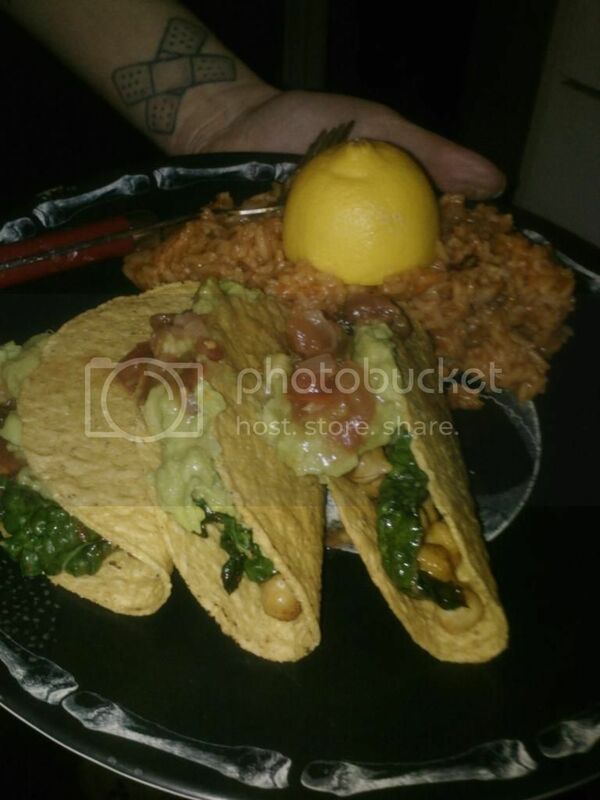 I stuffed each crispy taco shell with the kale-chickpea mix, guacamole and salsa. 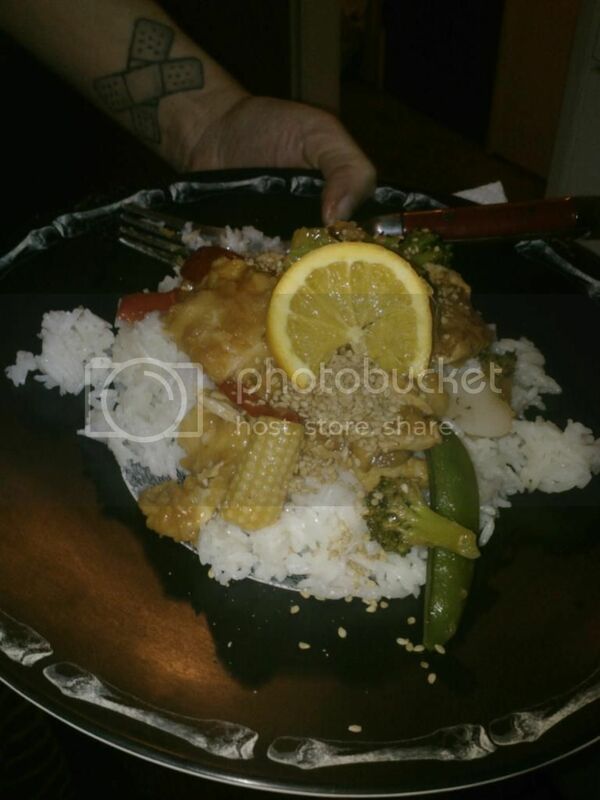 Served along with red rice it was totally good. What makes it White People Tacos? Well, when I asked Matt what he thought he said "they were good, something white people would really like". Matt was not trying to be insulting, he really liked them (I did too!). It was just a departure from my 'trying to be a taco truck' style of cooking! This is a gluten free taco - for those that usually see my tacos loaded with seitan and wheat tortillas. Everything was cheap/on sale and another good meal for two under or around $10.